Bankrupt automaker discloses details of plan to sell truck line to China's industrial company Sichuan Tengzhong. 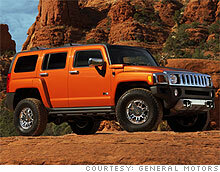 Hummer is one of the brands GM is shedding as it restructures. NEW YORK (CNNMoney.com) -- General Motors Corp. has struck a deal to sell its Hummer truck unit to a Chinese industrial business, the two companies confirmed Tuesday. Privately owned Sichuan Tengzhong Heavy Industrial Machinery Company Ltd., based in China, will acquire the truck brand, which has been part of GM since 1999. Tengzhong said it plans to keep Hummer's management team. "We plan to ... allow Humer to innovate and grow in exciting new ways under the leadership and continuity of its current management team," said Yang Yi, chief executive of Tengzhong. Yang said the deal "will allow Hummer to better meet demand for new products such as more fuel-efficient vehicles in the U.S."
The companies said the deal would likely close by the end of September. As part of the deal, some GM plants will continue to build the Hummer brand for the new owner, at least for awhile. The company said its Shreveport, La., plant will keep building Hummers for the new owner until at least 2010. The news comes a day after GM (GMGMQ) filed for bankruptcy protection in New York. "I'm confident that Hummer will thrive globally under its new ownership," said Troy Clarke, president of GM North America, in a press release. "And for GM, this sale continues to accelerate the reinvention of GM into a leaner, more focused, and more cost-competitive automaker." GM also said that the deal should protect more than 3,000 jobs in manufacturing and engineering, and at dealerships "around the country." The sale of the Hummer brand to a Chinese company will not impact the production of U.S. military vehicles. Military Humvees are produced by a different company, privately held AM General, based in South Bend, Ind. The Hummer and other large vehicles have been a drag on the U.S. auto industry since fuel prices spiked in 2008 and the recession deepened. GM said it sold 5,013 Hummers worldwide in the first quarter, down 62% from the 13,050 that it sold in the same period the prior year. Hummer isn't the only brand that GM is leaving behind. The automaker will also shed its Pontiac, Saturn and Saab brands and cut loose more than 2,000 of its 6,000 U.S. dealerships by next year. That could result in more than 100,000 additional job losses if those dealerships are forced to close. GM filed for bankruptcy hours after Chrysler's bankruptcy process cleared a hurdle when a federal judge approved its asset sale. The GM bankruptcy was hailed by President Obama, who wants a complete overhaul of the U.S. auto industry, even though the Chapter 11 filing is expected to result in the loss of 20,000 jobs and the closure of a dozen facilities. Citigroup (C, Fortune 500) was financial adviser in GM's Hummer deal. --CNNMoney.com senior writer Peter Valdes-Dapena contributed to this report.